You’ve asked for easier ways to keep the whole team community in the loop. We’ve built a tool to help with that. Coaches: No more email and text threads. Now you will know exactly who’s going to be at your team’s games and practices. Parents: As long as you’re a Confirmed Family Member of the team, you can RSVP to games and practices the minute the schedule comes out. Once Admins input the schedule and roster, they need to add contact information for each player. 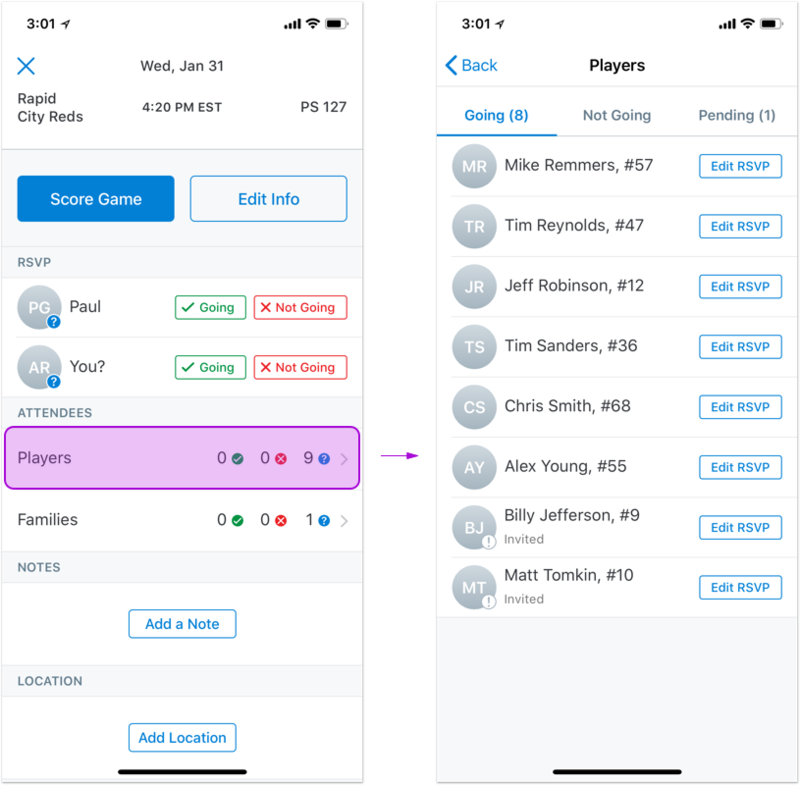 This way the player, or player’s family members can RSVP to games and practices, and we can notify them if there are changes to the schedule. Please note: availability/attendance info is always completely private. Only Admins, Confirmed Players and Confirmed Family can view availability status for games. If you are a player or family and cannot see an option to mark attendance, talk to your Admin about getting added as a Confirmed Member of the team. You can also go to the Teams tab and select the player you are associated with. 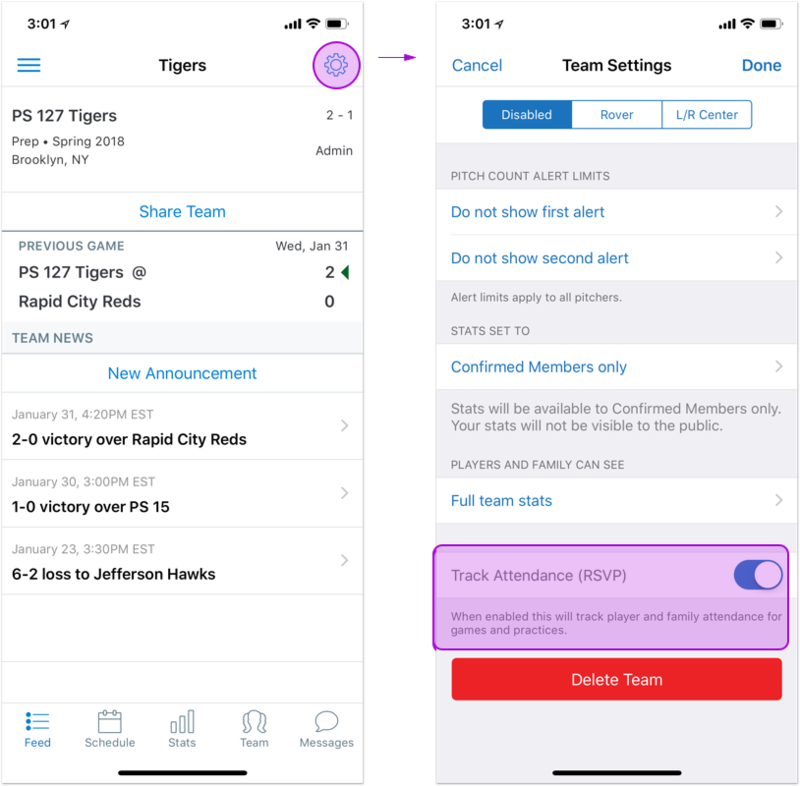 Under Team Settings users can turn ON or OFF attendance tracking/RSVPs for both practices and games. While the feature is only available on our apps, the turning on and off capability is available across all of our platforms (apps and website).